From Wikipedia, a percentile is the value below which a certain percent of the data lie. For example, 20th percentile says, “Twenty percent of the data is below the twentieth percentile” (see below example). 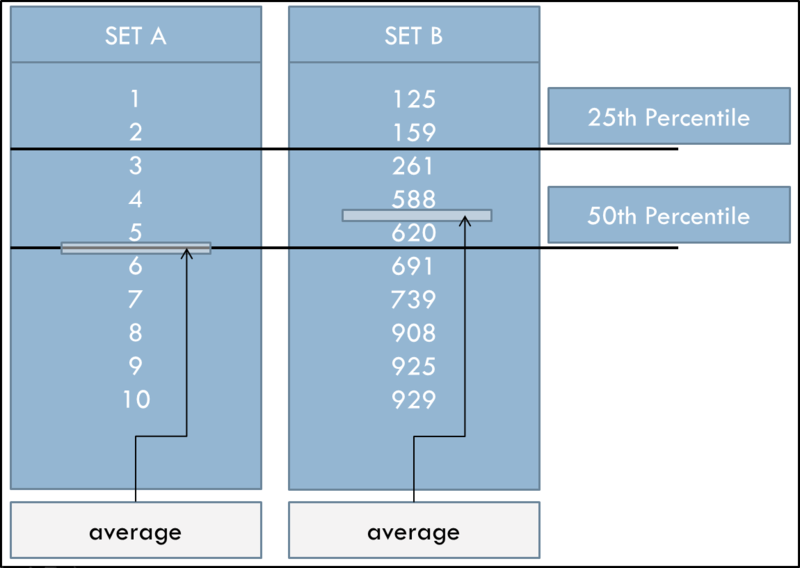 Specifically, a percentile is each of the 100 groups (1% – 100%) into which a population can be divided according to the distribution of data. In the below graphic, focus on only SET A for the moment. In SET A, there are ten numbers, so each number represents 10% of the population. The number “1” represents 10% of the population, the numbers “1” & “2” represent 20% of the population, the numbers “1” & “2” & “3” represent 30% of the population and so on. So, 25th Percentile is going to be somewhere between the second and third number (Hint: Use Excel 2010’s =PERCENTILE.EXC function for the exact value)! Specifically, the 25th Percentile of the data set 1,2,3,4,5,6,7,8,9 and 10 = 2.75! In other words, “25% of the data in SET A is below 2.75” (download excel sheet here)! Now let’s look at SET B. SET B is ten randomly-generated numbers. Since there are also ten numbers in SET B, each number here again represents 10% of the population. Just as with SET A, the 25th Percentile is going to be somewhere between the second and third number. Specifically, the 25th Percentile of the data set 125, 159, 261, 588, 620, 691, 739, 908, 925 and 929 = 235.5! In other words, “25% of the data in SET B is below 235.5” (download excel sheet here)! Notice how the position of the Percentiles is between the second and third number in both sets of data, but the Arithmetic Mean Average is not.